Hand pies: delicious warm and equally delicious cold! I was looking in my fridge the other day, poking around and trying to decide what to make for lunches for the coming work week. I came across a container of herb-roasted vegetables that I had made the previous week. I had eaten most of them, but there was still a couple of cups left. I opened the cheese drawer (or whatever it’s called) and came across a package of vegetarian breakfast sausage patties. I had eaten half the package several months ago, and just never got around to eating the rest. I had tossed the original packaging and didn’t even know the expiry date. I looked at the veggies. I looked at the sausage. I looked at the multiple containers of whole wheat flour that I keep in my fridge (What? I ran out of space in my freezer! Why do I have flour in my freezer? To keep it fresh longer, since I buy bulk packages. Now let’s move on!). I also rifled around in my pantry cupboards and came across a package of brown gravy mix. BAM! Inspiration struck, and lunch was born! I fried up the sausage into crumbles, mixed in the vegetables, added in the gravy, encased it all in delicious pastry, and voila! Lunches that are easy to eat on the go, for a snack, sitting on the sofa reading a book, and can be frozen and thawed with impunity. And you know what? The hand pies turned out FABULOUSLY! So yummy! So flaky! 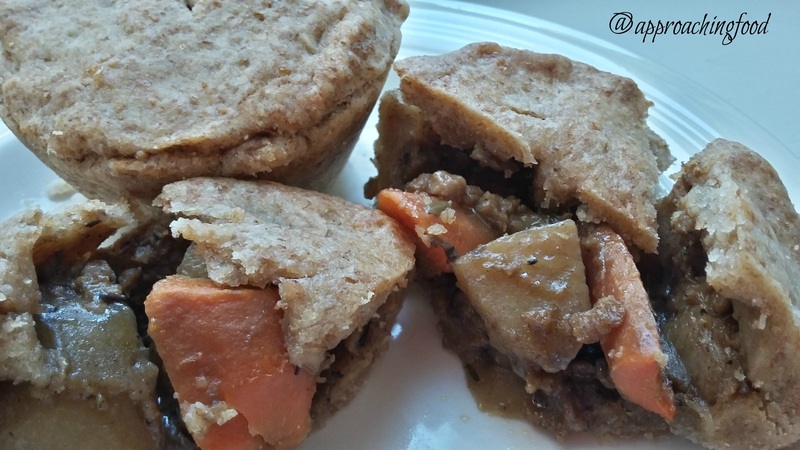 So full of meaty goodness with veggies and gravy in every bite! Ah, I do love a good hand pie! Fry up sausage crumbles. Make up gravy mix. Mix sausage crumbles, gravy, and roasted vegetables together. Set aside. Roll out pie dough. Using a drinking glass, cut out 7 circles. Take each circle, roll it out a little more, and fit into a muffin pan. Fill each of those with the meat-gravy-veg mixture, until just under the top of the dough. Take the remaining dough, divide into 7, and roll out into circles. Fit the circles on top of each pie, pinching the edges of the crust together. Cut an X in the top of each pie. Bake in a 425 degree oven until golden and bubbly (the filling is pre-cooked, so you’re really just baking the dough). Let cool before removing from pan. Enjoy your hand pies! These hand pies are so versatile. 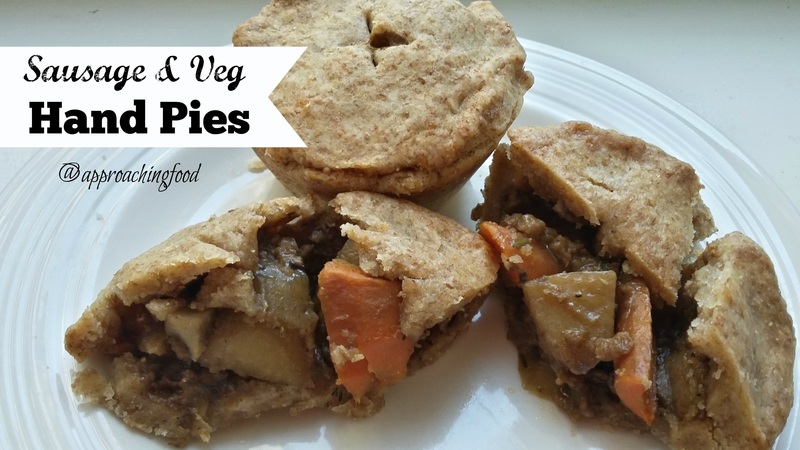 You can take almost any leftover vegetables, add in almost any type of leftover finely chopped meat (or veg ‘meat’), add gravy, pop it in pie crust, and who wouldn’t love it? Leftovers are the BEST! If you make this dish, let me know what veggies and meat you put in the crust! Let’s inspire each other!